Yeah, what she said. Nothing against Archuleta, he's a doll, but Cooks the man. By the By Jenny, check your e-mail for that recipe. For those that have not figured it out yet.....my wife is crazy! By the way Florrie, the Bishop wants to meet with you tonight. Something about your standing in the church. I share your love of reality TV. I don't know what it is, but I really get into the shows when I do watch them. I am having a really hard time getting into 24. It could be because I just can't quite stay awake for more than one episode and then by the next day Damon has watched the rest on that disc. 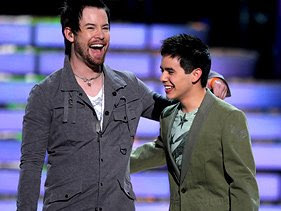 I'm a huge David Cook fan, but you do have to admit that it was Archuleta's night last night. It will be better if Cook doesn't win, then he won't have to rush to put out the typical AI winner CD and he can take his time and do it right. Guess we'll see how it goes. Damon, just what DO you watch....my goodness, you are so deprieved. David "Mormom" Archuleta is the cute little tiny one on the right. He didn't win last night, which you probably didn't know. I guess the power of the church wasn't enough to pull him through. 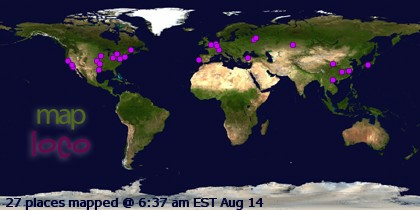 I know what you are probably thinking but you are wrong, (ok, I'm bluffing).